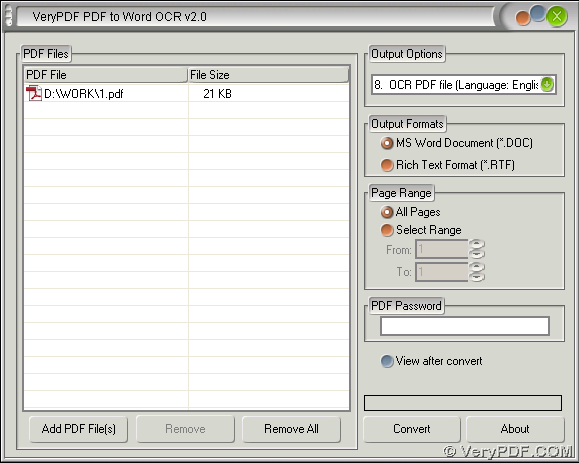 To edit scanned PDF on your computer, you can use PDF to Word OCR Converter, which is a tool that helps you convert normal and scanned PDF to Word file in Windows systems. To know more details, you can choose to read the following paragraphs. Step1. To use PDF to Word OCR Converter, please download installer of PDF to Word OCR Converter from this link, then double click it and follow setup wizard to install PDF to Word OCR Converter on your computer. Step2. 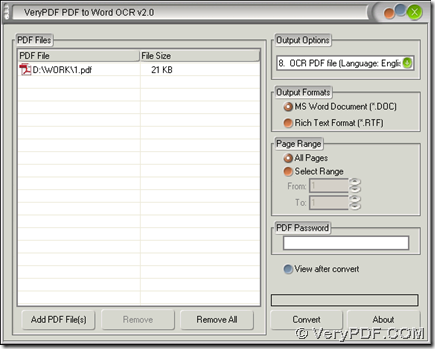 Launch PDF to Word OCR Converter in order to get its GUI interface. Then drag and drop PDF file into processing table so that path of PDF can display in processing table for it is successful to add PDF file for this process on your computer. Or you can use this way to add PDF file: click button of “Add PDF Files” > select PDF file in dialog box of “PDF2Word” > click “Open” there. So by now, the illustration to convert scanned PDF to Word file is complete, and you can go to official website of PDF to Word OCR Converter to know more of this software. And also if you have any questions on process to convert scanned PDF to Word, please leave your comment here. Thank you for your support. How to convert PDF to TXT?